The Wilhelm Gustloff was pregnant with lost souls conceived of war. They would crowd into her belly and she would give birth to their freedom. But did anyone realize? The ship was christened for a man, Wilhelm Gustloff... He had been the leader of the Nazi Party in Switzerland. He was murdered. The ship was born of death. It's January 1945 and Germany is facing a swift Soviet advance. Desperate refugees flock to the coast to board ships that will lead them to safety. This is the story of four refugees whose circumstances bring them together as they seek shelter and freedom aboard the Wilhelm Gustloff. 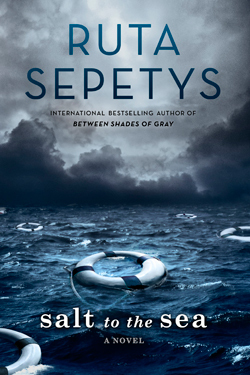 In Salt to the Sea, Ruta Sepetys does just as she did in Between Shades of Gray -- brought to light a moment in history that no one ever knew about. In this case, it's the biggest disaster in maritime history. Told in short chapters via four characters' alternating points-of-view, this book will leave you staying up late into the night to finish as you say to yourself, "Just one more chapter." And, as an added bonus, Sepetys managed to connect this story to Between Shades of Gray so that is an exciting moment in the story when the reader comes upon that realization. History divided us, but through reading we can be united in story, study, and remembrance. I hope Sepetys keeps researching, studying, and uniting us all through story for years to come.